Knee Support BUY Wrap Around Knee Support, ACE Knee Support, ACE Knee Wrap, Knee Wrap, Knee Compression, Knee Compression Wrap 207247, Knee Support Wrap. ACE Knee Support Wrap is made by 3M with Neoprene fabric to provide adjustable support and compression to the Knee. This Knee Support Wrap offers comfortable support for arthritis, sprains or general knee soreness. Ace Knee Compression Support relieves pain and knee strain. Offering moderate support, the ACE Knee Compression Support Wrap offers therapeutic heat retention that can improve circulation and promote healing. The Knee Wrap Neoprene fabric is also breathable, allowing excess heat and moisture to escape. 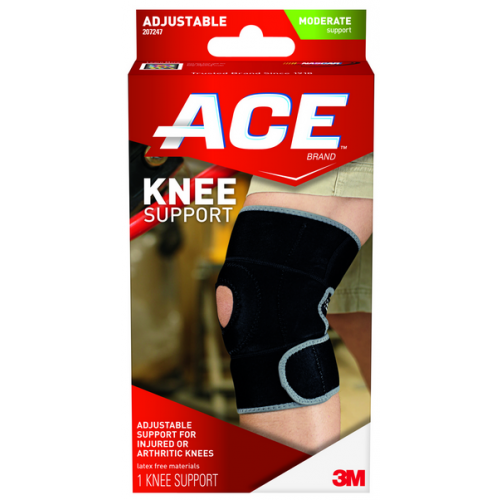 This same fabric of the ACE Knee Support Wrap is treated with a microbial agent to inhibit the growth of odor-causing bacteria. This Knee Support fits comfortably either the left or right knee. The 3M ACE Knee Support Wrap may be hand washed with a mild detergent. The Knee Wrap must be thoroughly rinsed and air dried. Color of the Knee Support Wrap may vary from the color shown in the image above. Adjustable compression to meet individual needs. 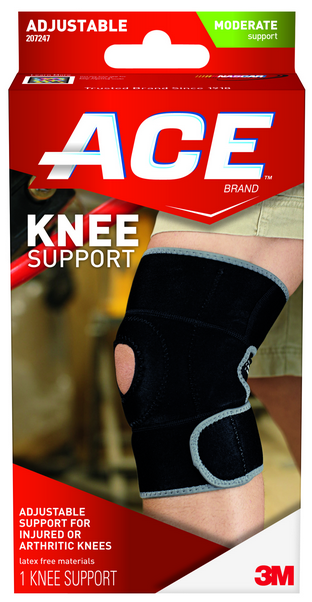 ACE Knee Support Wrap Product Number: 207247. Love the adjustable straps. Helps to keep the item correctly positioned. Ace knee support has an open design to cause less irritation with knee movement. Very light weight.